Yep, another set of awards for the top products of 2013. This time, I'm am giving you the low-down on all things face related, so that goes for base, concealer, blush, highlight, etc. etc. And, I will tell you now, base products are my weakness, so are lips, and eyes, and basically makeup in general - oops. Revlon basically rocks my world when it comes to foundations and bases.The shades match my pale skin perfectly, and the formulas work pretty well where things get quite oily on my face, but don't get cakey on my drier cheeks *claps*. So, for the higher coverage option, Revlon Colorstay in Buff (Oily/Combo) is the bomb dot com, literally. This covers all my blemishes, redness, and scars (with a tiny bit of help from a concealer), but still looks natural, and is pretty flawless. Then, for the lighter offering, Revlon Nearly Naked in Vanilla is perfect. This still covers most things, more so simply blurs the skin, but looks radiant, without being shiny. Then, onto concealer. Of course, the Collection Lasting Perfection Concealer in Fair does it for me. Oh, how I wish this was the Nars Radiant Creamy Concealer but my purse won't allow it, but for a mere £4.19, this covers everything. Sometimes people complain about it being cakey, and I have had some bad experiences, but on my combination skin, this just does so well at covering, and lasting all day. I have been through a good 3-4 of these in varying colours this year, and after buying the Bourjois offering, I think this one still wins that spot in my heart. Blush. This was the year that I fell in love with cream blushes, and more so now that I own the Real Techniques Stippling Brush. This Topshop Cream Blush Duo in Up in The Air was purchased in the January sales last year, and I have been loving it all year through. The formula = perfect. The colours = perfect. The lasting power = perfect. What more can I say. Finally, as you can see by the pan-hitting going on there, the Sleek Face Form in Light was obviously going to gain a spot in this post. The highlight and contour are the best parts of the palette, but the blush is lovey too. The contour is the perfect colour, so I'm getting any orange lines going on all up in my cheekbones, and the highlight adds the nicest pink/champagne glow you ever did see. Love collections concealer, my favourite! 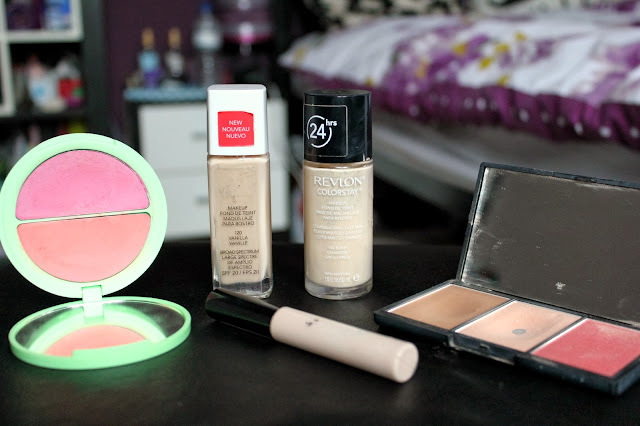 I love revlon as I have pale skin too :) I've now got my eye on Nearly Naked for the summer! I absolutely love the Nearly Naked foundation, probably my top favourite of the whole year! I really want to try the Sleek face form palette, it looks amazing.